Blurb: For those who are in love with a commitmentphobic person. Learn the secrets. 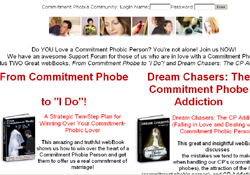 This amazing and truthful webBook shows us how to win over the heart of a commitment phobia person and get them to offer us a real commitment of marriage. Now you can learn the special strategies you need to get your CP to open up to you, come back to you, and want to be with you - forever. Learn all about loving a commitment phobic person.